Friday we continued east on Hwy 13 and left Harrisburg early due a forecast of high temperatures. It was delightfully cool and the corn and soybean fields were covered with the heavy dew from high humidity. We passed through Shawneetown and proceeded over the Ohio River via bridge. The bridge was a cantilever like the one at Chester and we quickly descended into Kentucky. However, there was no border sign for a picture. We pedalled east now on Hwy 56 and were delighted to see a new crop - Tobacco! 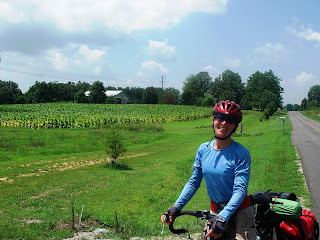 Here is Belinda with a tobacco field in the background. 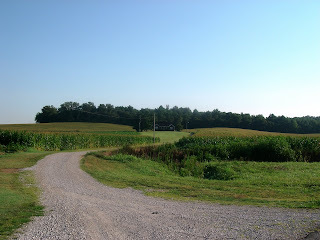 The terrain was gently rolling and full of fertile farms like the one pictured below. We finished the day in Sebree, KY. The minister of the First Baptist Church, Bob and his wife Violet, have been hosting bicyclists in Sebree for many years. We stayed in the church and Violet made us a wonderful meal of chicken bearnaise. We have passed several fancy horse farms with white fences and big barns. 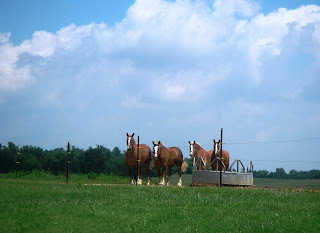 The horses pictured below however caught our attention. They are a matched team of Belgians which is a heavy horse for pulling loads. They were just as interested in us as you can see. Saturday we left Sebree late in the morning and continued east on Hwy 56 for a short day of 27 miles ending in Utica. We stayed in a volunteer fire department's firehouse for the night. Lucky for us there wasn't a fire; however, we did hear all the 911 calls on the radio equipment all night. Today, Sunday, we made another early start since the temperature forecast was for mid 90's. The terrain got more challenging as we continued east. After several road changes, we pulled in Falls of Rough on Hwy 79 near Rough River State Park. A rest day is planned for tomorrow after six days of cycling. Milestone for today - surpassing 3000 miles! Great as always to see the new post. Nowadays, I always copy your title directly into Google Maps, and check out all the towns and cities and terrain around your route. Since I don't know the East, it is fun to zoom out and see St Louis, Louisville and Nashville surrounding you guys. Then I zoom out until I see your little route on the entire country map--what a perspective! Your pictures are outstanding--makes me want to go "have a smoke" looking at all that healthy tobacco; and the farm and horses were beautiful. Fascinating, as always to hear about the little details, like dew, corn and soybean fields and bridges. My dad was a minister, and we always called churches in small towns for housing, when we rode cross-country in '73. It is comforting to hear that it still works in these times. Congratulations on the 3,000 miles! Hey Mark, sounds lke you're having more fun with our trip than we are! So glad you are enjoying the journey! How was your Caribbean vacation? I hope you had loads of fun. History depicts Kentucky and tobacco as synonymous; however, Steve has been working with a group of Kentucky growers trying to switch gears to vegetables and there has been promising advancement in that area. Tobacco growers represent a deep rooted tradition and change is slow but "the times they are a changin'". The horses and ranches look amazing. Three thousand miles..wow. I'm still enjoying following your trip (and no, I'm still not counting clusters). Some of the scenery and small towns are so beautiful it makes me want to move there - especially all the roads with no traffic on them. I'm also wondering how Jack is faring in all the exciting weather - especially in the loud thunderstorms. Was he quaking in his boots? Hi Diana, well we're still in western Kentucky and while we see tobacco every day, soybeans and corn are predominant. Perhaps as we move further east, and up into the highlands we'll see more tobacco. I would think that it must be the highland farmers who can contemplate switching to vegetables as it is still very hot here in western Kentucky. Hey Riesa, glad to hear from you! Western Kentucky is very beautiful! It's the first place since Colorado were we have thought we could live here. The humidity is high but seems lower than Missouri and Illinois. Humidity is a great killjoy for us westerners! Jack does very well in the thunderstorms. It was a big suprise to us because our first Jack Russell went nuts when the thunder boomed., but Jack stays calm. Oh.. and stick to your guns Riesa! Wait, you didn't tell us why there are 2 Lutheran churches that close way out in the country? !